Let's just say that finally the day has come for me. 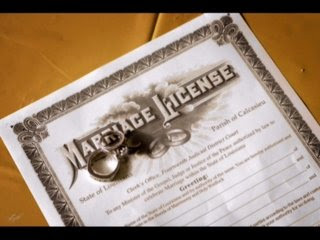 Last week we decided to picked up our marriage license so that anytime by now after 24 hours we will be able to get wed and I will be formally Mrs. H. Isn't that very exciting? well, everybody does.. especially girls right? Yup, officially soon a week or two I will be married here to the man in my dreams. I don't want to give out exact date yet but I will make sure that I'll inform you all once the final date was been made. And it was really not that difficult though after 5 minutes we have our license that quick and easy. I may be very sad as though my parents would not be seen me in that special day, but soon we will do the same thing in Philippines that way, my whole family would be seeing me walking into that aisle and finally be bless by the God Almighty. i'm so excited for you! just sad that your folks won't be there to witness it. but you can always get married again in the philippines! hahaha! good for u, Novs. would like to congratulate u in advance. am i invited? Hehe. I am wishing all the best Nova.. Peace and Happiness may always be with you.. God Bless and take care always. wow~ sis, congrats! best wishes to both of you! ma drama nga ang kinakasal sis...di mapigilan ang luha kahit pa sabihing masisira ang make up...hehehehe..
btw sis, pls check this out you may also want the idea!